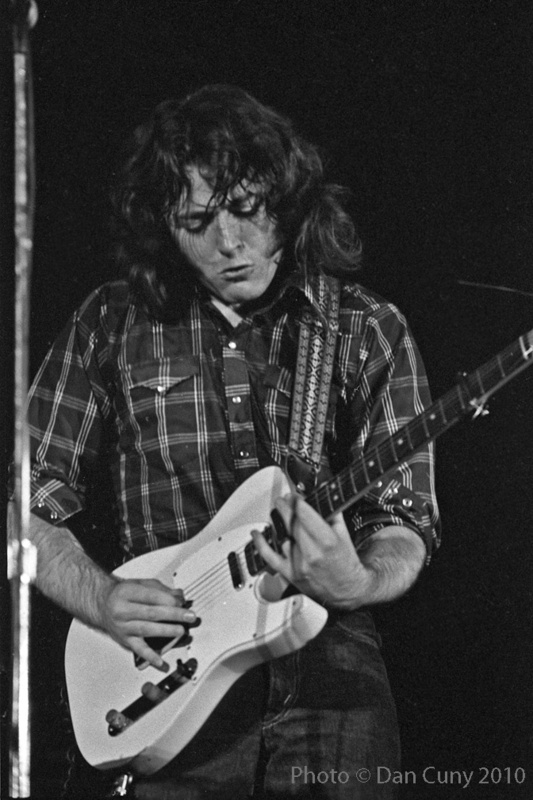 Editor's note: Although Rory Gallagher was Irish, not British, we are featuring him on Brit Rock by the Bay as a means of remembering him and honoring his music. Rory Gallagher was born on March 2, 1948, in Ballyshannon, County Donegal, Ireland. He played the ukulele as a child, and began playing the electric guitar while he was in his early teens, when his family was living in Cork. At first he learned tunes by listening to the radio, and from the start he was strongly inclined toward the earthy sound of American music, particularly the songs of Leadbelly, Woody Guthrie, and Muddy Waters. 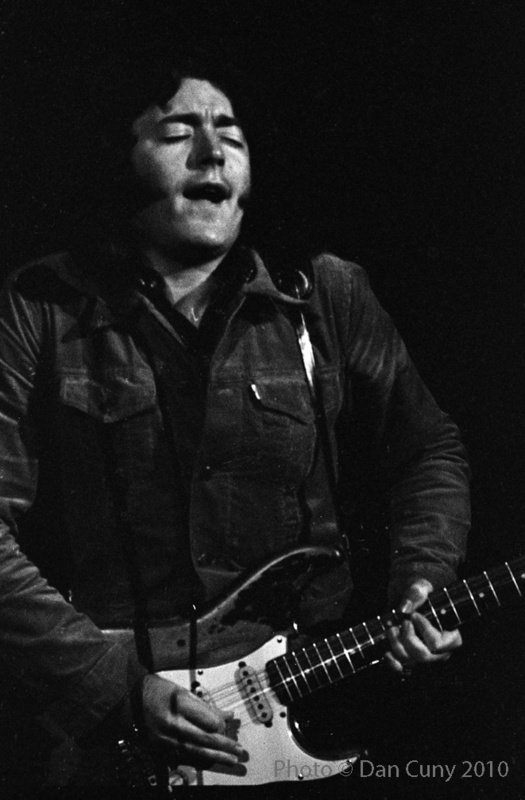 He first performed in Irish bands, playing covers of current hits, but soon wanted to play in his own style, which was deeply grounded in the blues. 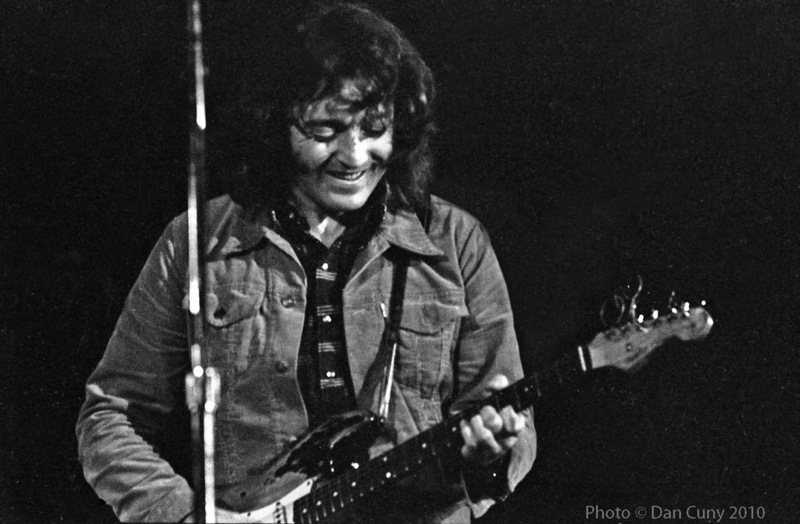 In 1966, Rory Gallagher formed Taste, a trio that started out performing in Belfast, Northern Ireland, and Hamburg, Germany. 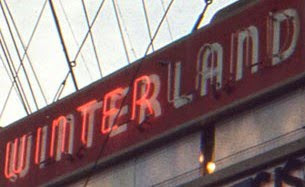 Within a few years (after a change in the first lineup), Taste moved to London. After releasing two albums on Polydor Records, Taste (1969) and On the Boards (1970), and appearing at venues throughout the United Kingdom, they had gained a wide and ardent following. 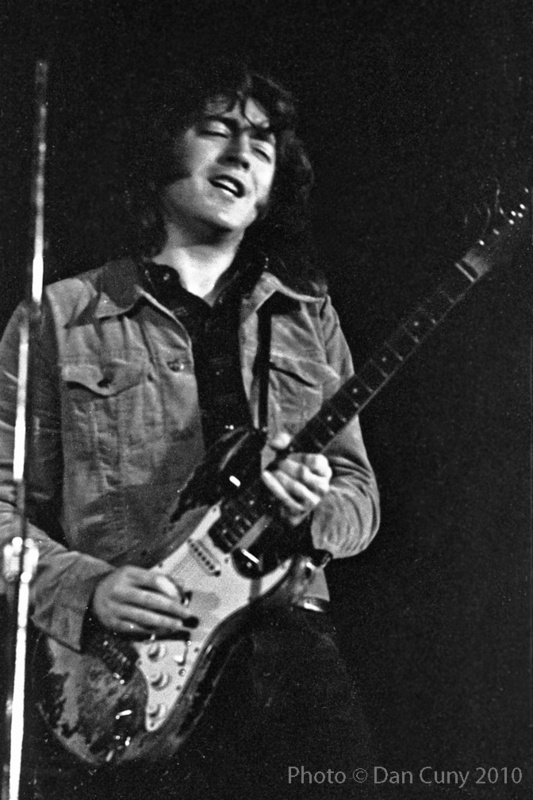 In 1970, Taste ended when Rory Gallagher chose to continue as a performer under his own name. 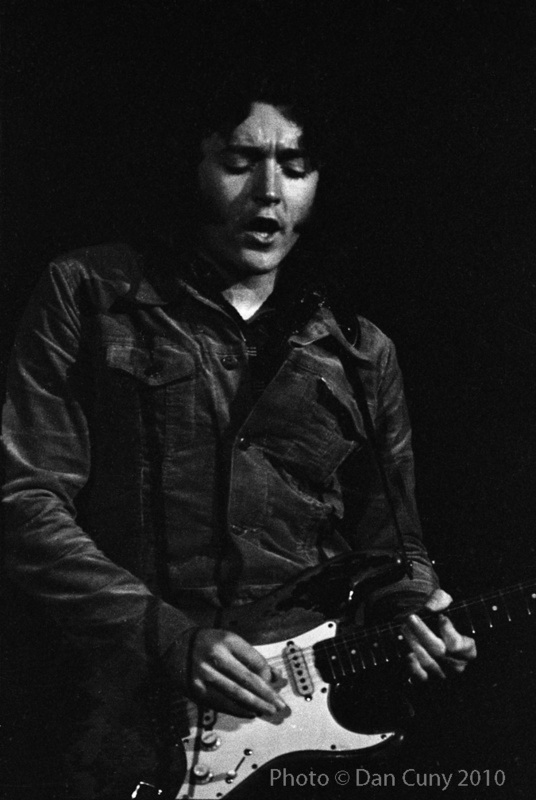 His first album after leaving Taste, Rory Gallagher, was released on Polydor Records in 1971. 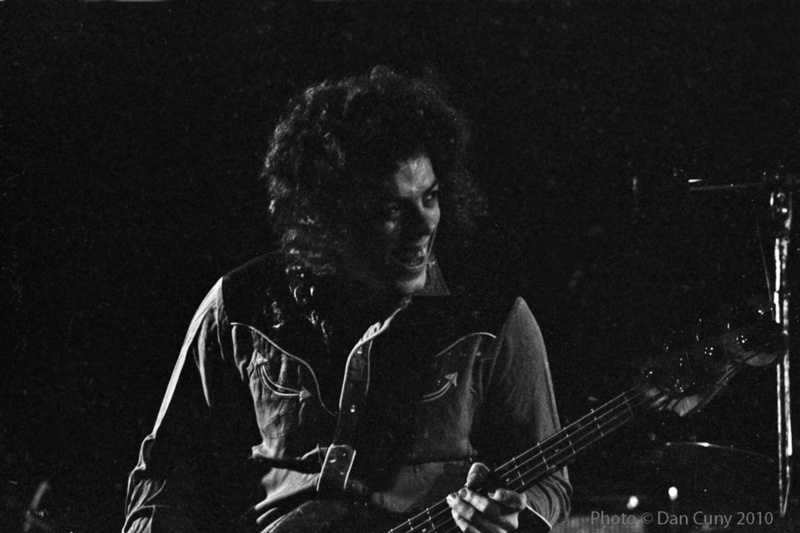 It featured Gerry McAvoy, a bassist who would continue to play with him for the next twenty years. After Rory Gallagher, his next album was Deuce, also released in 1971, and then Blueprint (which included "Walk on Hot Coals," a compelling song that served as a vigorous showpiece during his performances) and Tattoo, both released in 1973. When Rory Gallagher appeared onstage at the Cow Palace in October of 1973, opening for The Faces, his hard-hitting band included Gerry McAvoy, Lou Martin on keyboards, and Rod De'Ath on drums. Rory Gallagher was a fiery performer, a humble man filled with an honest fervor for his own music, and he always played the six strings of his well-worn Stratocaster as if his life depended on it. He was an open and straightforward musician who never strayed far from the authentic blues that had first inspired him. David: I generally did not enjoy shows in the large halls as much as the small venues, but this was a memorable concert for many reasons. There were three top acts: Rory Gallagher, Earth, Wind and Fire, and Rod Stewart and The Faces. We were not at the front of the stage, but close enough to get a good look. 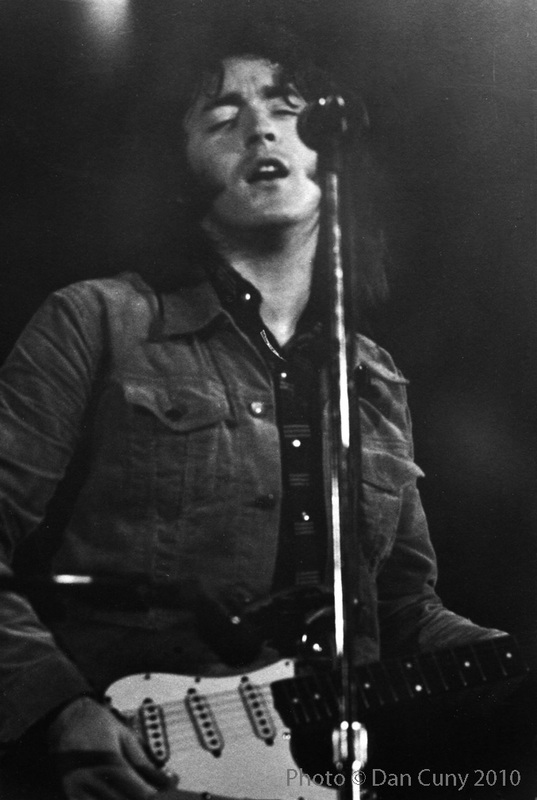 Rory soared through his music with an energy and lust that was mesmerizing. A natural talent, he was at home on the stage backed only by bass, drums, and keyboards. On his albums he plays some acoustic guitar and clarinet with some touches of jazz, but on the stage it was no holds barred rock and blues. 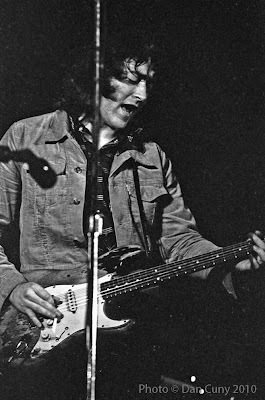 Anyone lucky enough to have seen Rory Gallagher knows what a great singer, songwriter, and guitarist he was. Gary: I really miss Rory Gallagher - he passed away far too early. His band could really deliver the goods. When we saw them opening for The Faces at the Cow Palace, I had the feeling watching them, that I was in the right place at the right time. The show at the Cow Palace was around the time of one of my favorite Rory Gallagher albums, Blueprint, which had great tracks like "Walk on Hot Coals," "Daughter of the Everglades," "Seventh Son of a Seventh Son," and "Unmilitary Two-Step." (Just the names alone were great.) 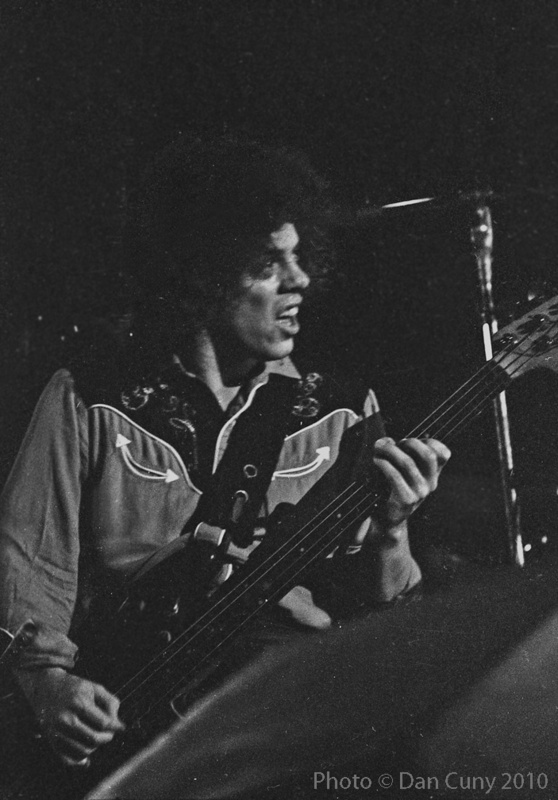 He played traditional blues with hard driving rock, and wrote much of his own music. The next LP, Tattoo, had "Cradle Rock," "Sleep on a Clothes Line," "Admit It," and my favorite, "A Million Miles Away." Some of the more reflective songs were haunting and beautiful. "A Million Miles Away" was a driving, minor key masterpiece. The band was very energetic. 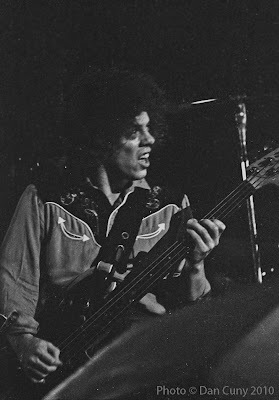 Gerry McAvoy was great bass player, and in his look and stance really appeared down-to-earth. He really fit tunes like "Bullfrog Blues." Lou Martin played the electric piano with great energy and precision, with high volume trills on blues scales that really pushed things to another level. 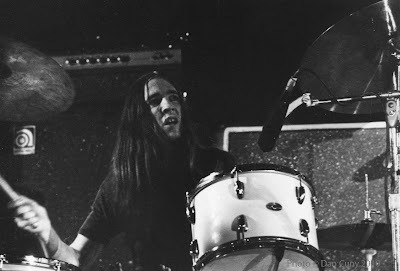 Rod De'ath was a down and dirty drummer, a great match with McAvoy in the rhythm section, rock solid. 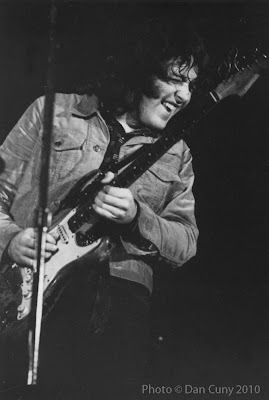 Rory Gallagher was a blistering guitar player, putting everything he had into wringing out those notes on his Fender Stratocaster. A powerful performer with a great voice, and he could play a mean harmonica as well. I'm glad we saw them when we did. They outplayed The Faces at the Cow Palace. Rory Gallagher will always live in my memory. 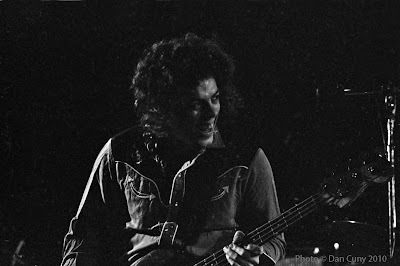 Dan: Having seen Mott the Hoople ten days earlier, David, Gary, Michael and I were back in concert mode at the Cow Palace to see Rod Stewart and The Faces, Earth, Wind and Fire, and the opening act, Rory Gallagher. I was really excited to see him since earlier in the year I had purchased Blueprint, and just loved that album. about a month before we saw Rory, he released Tattoo, which I remember buying at the record store and listening to, so that I would be prepared for the show. His set was somewhat short, probably around forty-five minutes, but he was one of the best performers I've ever seen. He made playing the guitar look effortless. I can remember him playing several songs from the Tattoo album ("Tattoo'd Lady," "A Million Miles Away," "They Don't Make Them Like You Anymore"), as well as some from Blueprint ("Walk on Hot Coals," "Banker's Blues"). Rory's slide work was magical. Gerry McAvoy's bass playing and the drumming of Rod De'Ath were very tight. You could tell they had been playing for some time. Watching Rory Gallagher play, even for such a short time, I was hooked. 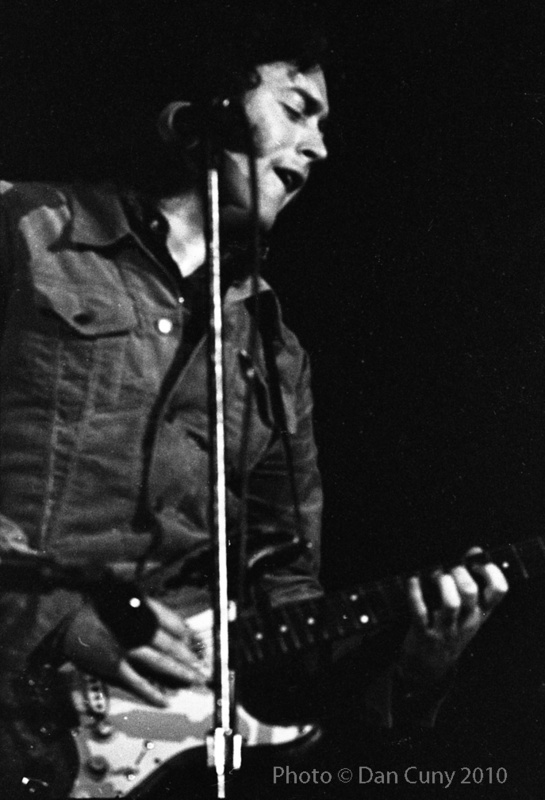 He was a fantastic songwriter, guitar player, and performer. Michael: Although Rory Gallagher was at the bottom of the bill at the Cow Palace, under Earth, Wind and Fire and The Faces, he was able to make a strong impression. He was an engaging performer, but he did not need any tricks to put his music across to an audience. All he had to do was stand there, in a plaid shirt and bluejeans, and play his heart out. I remember being particularly excited to see him play his famous guitar, a 1961 Stratocaster with most of the paint worn off from constant use. 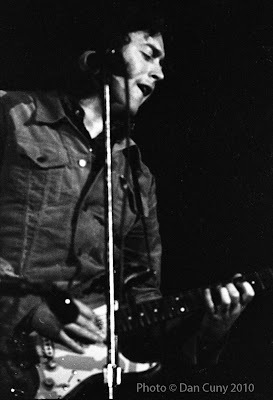 His guitar, which he appeared to view as an musical extension of himself, had come to be seen by his fans as a representation of his own hard-working character. 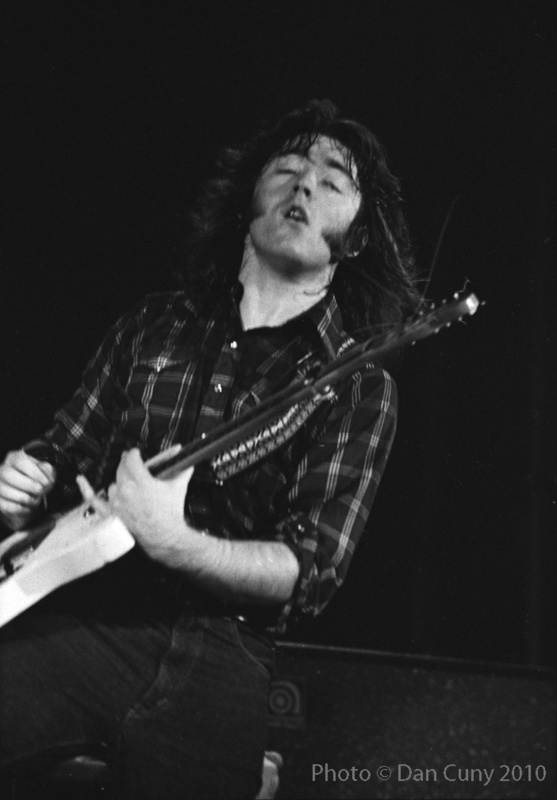 Rory Gallagher was a well-known and highly regarded musician, but he also was a man of the people. The feeling that came through in his guitar and his voice was powerful. He clearly was not putting on an "act" when he performed. We were standing fairly close to the stage, so we could see him working and sweating through each song, putting his all into every note that he played. 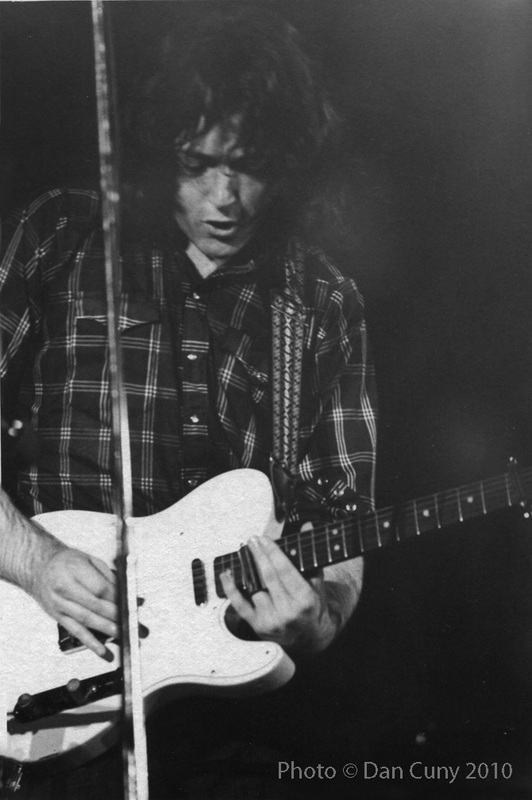 With Rory Gallagher, honesty was everything. I only got to see Rory perform once, on Oct 12, 1982 when he opened for Rush in St Louis. I've been a huge fan ever since. He still had the energy and passion you describe. I wouldn't have wanted to be in a band following him on stage! Thank you so much for these memorable photos! I'm one of the lucky ones to have seen Rory live.., and reading this short but great story about him brought a tear to My eyes. Still play his songs almost every day... he will never die in the minds of so many of his adoring fans ! Great pics and perspective. Rory is awesome! Nice article. Except for the British part. Errrm. Rory was Irish. A cork man like my good self. Don't call him British. Must have seen Rory live a dozen or so times. He so obviously loved what he did - promoters used to have a hell of a time trying to get him to stop playing. Fantastic in every way! I saw Rory 6 times with Taste and 7 with RG Band. Also an open air concert in Inverness with Taste at Inverness Caledonian Stadium. I saw a lot of great bands in my time but nobody beats Rory Gallagher!! I try to play Rory's style on Youtube under daviemcf channel.This is a great site btw!! Yup! I was lucky enough to see Rory and his band 6 times, he made the hairs on the back of my neck stand on end every time..pure electric...sadly missed every day. Fantastic post, guys, and nicely complemented by Dave's post on David's Rock Scrapbook. I love the vibrant new look of your blog. 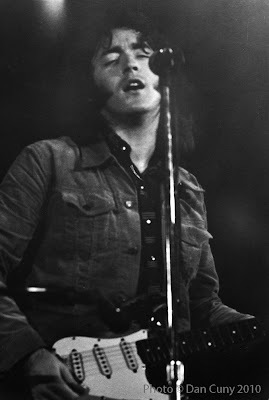 One of the greatest guitar players this world has ever seen....first saw Rory live when I was 14 years old (1972) and was hooked.....was SO lucky to see him at least once a year in the UK and also met him a couple of times. Visited his grave in Cork 18 months ago, laid a single red rose and a note that said "Love you Rory, Always Have, Always Will." A huge loss to all who loved him. if you love Rory you'll love this! the legend that was and still is rory.u can call it what u want i call it messin with the kid! you're right with your comments: this line-up was pure magic, class-act musicians..Lou, a keyboard-wizard, Rod, totally underrated drummer and the secret weapon of the rory Gallagher band: Mr Mc Avoy ! I saw Rory play in Dublin several times in the 70s. Best gigs I was ever at, simply because of the energy of the man. A Rory gig was like a big party, he loved playing live and no-one could play like him. saw him 10 times in his career, always played like his life depended on it. always looked like someone was holding a garden hose over his head with all that sweat coming off it. i been a fan of Rory since 1973! friend of mine who was ahead of his time at our age of 13 turned him on to me amongst others but the Irishman from cork still stands the test of time!!! 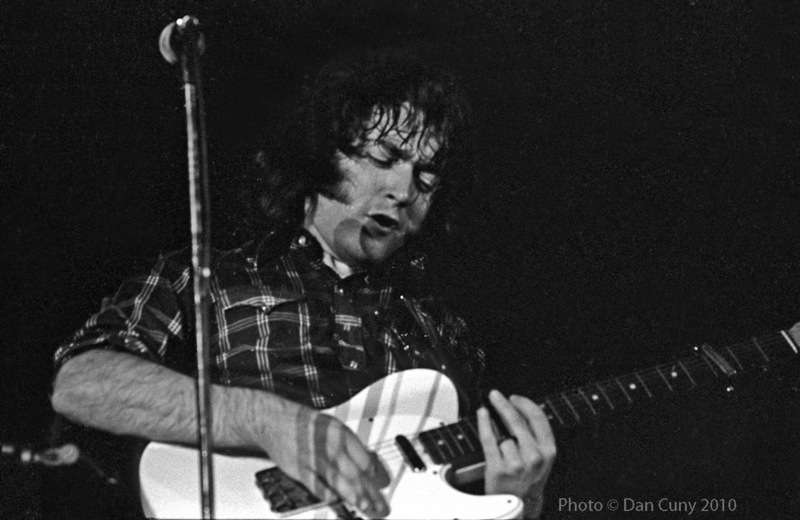 Do you think that Rory Gallagher deserves an ultimate recognition? Rory has lovers in many parts of the world ... here a Brazil fan since 1972. Thanks for all documents. I saw him and thought he put Rod Steward to shame.